According to army sources, barrel explosion happened last week, when the US manufactured gun was firing Indian ammunition and field firing was aimed at compilation of firing tables. 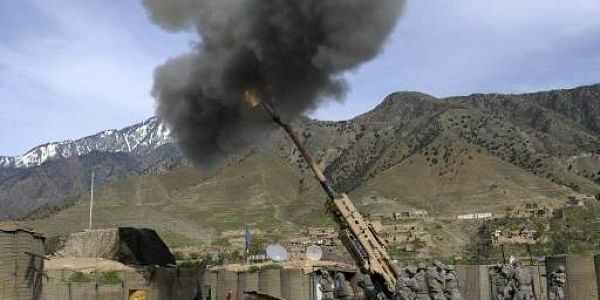 NEW DELHI: In a setback to Indian army’s artillery program, barrel of the US manufactured M777 Howitzer gun exploded during ongoing calibration trials of ranging gun with Indian ammunition. Army sources claimed there were no injuries. The incident happened at the army's Pokharan Field Firing Ranges. In May, Indian Army had got two 155mm/39 caliber ultra light howitzers (ULH) from BAE Systems after a Rs 2,900-crore deal, which was a government-to-government deal under the Foreign Military Sales (FMS) route, was completed in November last year. The Army has not inducted any modern artillery gun after the Swedish Bofors guns were inducted in the late 1980s. “The barrel of the gun has been damaged, the extent of which is being assessed by Joint Investigation Team, which is on the site. There has been no injury to any person,” said army sources. Further firing for compilation of FT (firing table) shall recommence on analysis of the Joint Investigation Team, army sources claim. Having initiated the deal for M777 guns with the United States in 2010, the government finally announced a deal for 145 guns on June 26 last year. The first two guns had come in May and next lot of three more guns is expected to arrive by the end of this month. The complete induction will happen by 2019. India will join US, Canadian and Australian forces to use M777 howitzers. According to an army official, the M777 is very useful for mountain warfare, especially for the newly created Mountain Strike Corps for the Sino-Indian border. Army's 220 artillery regiments have received no new artillery since the 1980s, when the FH-77B, 155 mm/39 calibre Bofors gun was bought. Mired with the allegations of kickbacks, only 400 Bofors guns were delivered and rest of the contract could not be completed. Significantly, Bofors guns played a key role in Kargil operation in 1999 against Pakistani intruders.